California Lt. Gov. Gavin Newsom (D), who is running to replace Gov. Jerry Brown next month, debated Republican gubernatorial candidate John Cox on Monday. Following the debate, Newsom answered reporters' questions about his vision for California's future. Interestingly enough, Newsom said he'd be willing to take on the status quo, even if that meant taking on his own political party. "I'm not arguing for the status quo. 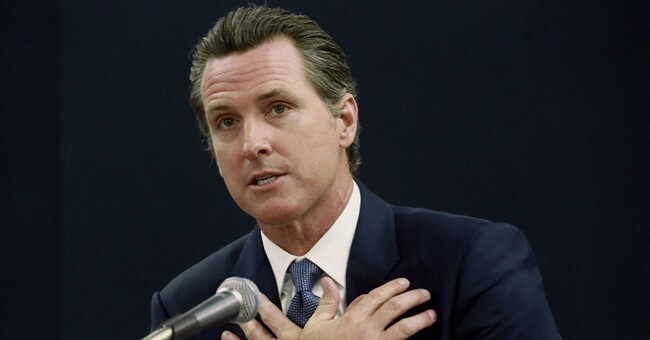 I'm arguing for change," Newsom told reporters. "I've always been about change...I'm willing to change the order of things. I'm willing to challenge the orthodox, even within my own party. I'm not arguing in any way, shape or form for the status quo but I want to build on its success." How can someone be against the status quo and want to change that but also build upon the very thing they say they're against? Isn't that contradictory? Newsom has been a typical progressive. He's advocated for even stricter gun control laws, net neutrality legislation, greater access to abortions, illegal aliens over American citizens, and the list goes on. That's not challenging the status quo. That's falling in line with your party. Newsom is one of those well-off politicians who likes to act like he's doing good for his constituents. He's not. He's doing what benefits Gavin, what keeps him in power. He's sitting on his throne, telling average people like you and I what we need and don't need. Except he's never walked a mile in our shoes, has he?